The Salvador Dali Tarot Book is a prestigious Jubilee edition paperback of quality full colour reproductions of the 78 cards in the Dali Universal Tarot deck. It contains detailed interpretations for each card, information about layout and method of choosing and reading, the sources and inspiration of the images and further information about Dali and his work with the Tarot. This deck was created by Dali in the mid 1970s when he was 70 years of age and he was the first well-known artist to produce a set of Tarot cards. Each image depicts a mysterious, irrational and dream-like scene with enigmatic emblems, such as butterflies, crutches and silhouettes. Some images have been inspired by famous places and by distinguished European artworks throughout history. Several are original works by Dali. The 22 Major Arcana provide unorthodox correspondence for Hebrew letters and astrological signs. 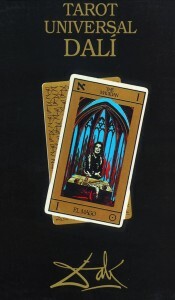 Each Major Arcanum card is titled in both English and Spanish, for example ‘Los Enamorados’ for the Lovers and ‘El Loco’ for the Fool. 0 The Fool is positioned at the end of the Major Arcana and the Court Cards describe Queen, King, Knight and Page. The suits are represented by Wands, Cups, Swords and Coins as Pentacles. We are instructed to think of a question, shuffle the deck, select and allow intuition to guide us in choosing a card. I have chosen two cards: Card number 1, The Magician and card number 9, The Hermit. 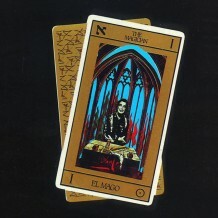 The Magician (El Mago) has been chosen to illustrate the deck on the front cover of the book. Described as the card of ‘Personal Magic’, the energy is real magic which is not limited to trickery, sleight of hand, hocus-pocus or stage illusions. With this magic, we transcend the normal and become one with ourselves, with God and the world. It shows Dali himself in the central position as the Magus; in front of him are many of the tools of his trade and some of his most well-known works, such as the melting clock which represents elasticity and uniqueness of our own personal view and experience of time. The scroll symbolises the making of plans and the designing of our own life path. The scene is reminiscent of Leonardo’s ‘The Last Supper’ with Dali in the position of Jesus with the bread and wine on the table, representing our participation in the divine act of creation. The arches are those of Sainte Chappelle, Paris, the pillars of which denote aspects of the personality which need to complement each other and unite to serve a higher purpose. The card interpretation states: We see Dali, but we realise that this card is really about you and me and our own individual talents and qualities. Flames lick around the central character, these are the fires of the creation and transmutation and the life-force which is within us. 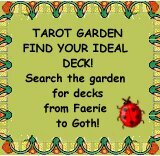 We are instructed by this card to make the most of our imagination, creativity and communication skills and to do something extraordinary and unique. The Hermit (El Ermitano) is described as ‘Healing’ and we are reminded of the New Testament story of the wise virgins who keep the wick of their lanterns cut and ready. The card directs us to re-evaluate and re-organise our life. The image is of Luca Pacoli, a lecturer of genius at the University of Perugia, Italy, born 1445. He invented an advanced book-keeping system. He also wrote a book about the entire knowledge of mathematics which was illustrated by Leonardo Da Vinci to whom he taught the art of perspective and proportionality. He inspired Leonardo to paint The Last Supper, a fresco at the Dominican Monastery of Santa della Grazie. The Hermit appears to float above a black cloud. For me this cloud represents the miasma of the common-place. He wears the brown robe of the Franciscan and holds in one hand a stick as though he is writing in the clouds or parting them and in the other hand he holds a lantern. I am reminded of Holman Hunt’s ‘The Light of the World’ in St Paul’s Cathedral, London. Within the light of the Hermit’s lantern, we see an embryo which contains the spark of human life and the potential for a lightworker to be born and commit to becoming a leading light of truth, peace and caring justice. Above the head of the figure, we see jewels, some in the shape of an egg, which reminds us of the origin and miracle of life. The card states: Your light expands by resolving your contradictions. You will not get close to the magnificent power of the Hermit if you are not assuming responsibility for your life. The Hermit solves problems at the appropriate time and goes about his life without sweeping anything under the carpet or leaving anybody in the dark. The card is about using your own light to heal and sanctify the world and help to recreate a ‘virgin’ earth.” The card sometimes directs us to rest and withdrawal but also to commitment, effort and responsibility. We are instructed to ‘pay our debts’ – in a material as well as moral sense, to increase our own wellbeing and wealth (whatever that might mean to us) and to spread our good fortune to others. A reprint of the Dali Universal Tarot is due for release, with Johannes Fiebig as the author, sometime in 2013.